Elegantly designed, Wood Panel Screen in Slick Brown Finish & Lightweight is a perfect home accessory for modern setups. This stylishly designed Wood 4 Panel Screen is a wonderful way to partition large rooms. The Wooden Room Divider is made from high grade wood which makes it extremely robust for long-lasting usage. With its lightweight design, this screen can be easily moved from one room to another to create a partition or an intimate seating area. Detailed with a slick brown finish and a glossy texture, this screen is sure to give a touch of urbane finesse to any casual or contemporary style setup. The Partition screen has four paneled design and is supported by smooth hinges which allow ease of use and space-saving storage. Room dividers are a great way to break up a room, be it a living room or an office space. 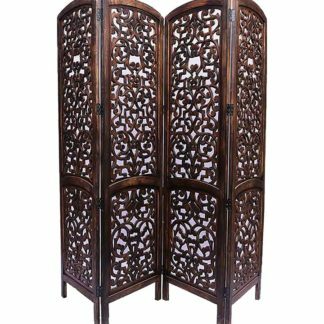 By placing room dividers, you can make the best of the space and improve the effectiveness of each space.Bestowing upon the latest interior decor trends we have been able to execute this Designer Wooden Room Divider / Partition Screen into traditional and antique furniture designs.